Every Christmas Day, we hear the words: “The Word became flesh.” Sadly, I think that these words often 'go in through one ear and out the other' and this happens for two reasons. The first is precisely because we hear them so often, it has become an empty formula commended to memory through rote repetition. The second is that those words are so profound, our brain generally shuts down when it is incapable of unpacking what it is attempting to comprehend. As our faith tries to grasp their meaning, their depth overwhelms our understanding. But for us to fully grasp the meaning of the Ascension of the Lord, we must first try to comprehend exactly what took place at Christmas. Has Christ’s Ascension come to mean that Christ is now in a disembodied state? 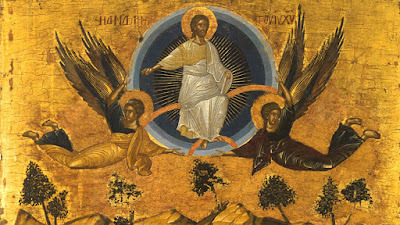 Has the event of the Ascension finally allowed Christ to shed His flesh so that He may return to His invisible pre-Incarnation spiritual state? His Ascension seems to have established a further level of invisibility so as to remove Him completely from our terrestrial realm into a heavenly cloud that takes Him “out of sight.” But the Catechism of the Catholic Church tells us that the Ascension of the Lord refers to “the entry of Jesus’ humanity into Divine Glory in God’s heavenly domain, forty days after Easter.” What does the Church mean when we speak of Jesus’ “humanity” or of His “human nature”? By humanity, we mean the human body and soul that the Son of God united to His Nature as God, at the moment He took flesh in the womb of the Holy Virgin Mary, and it is this “human nature” that was exalted at Jesus’ Ascension into glory. In other words, the Ascension did not mean the dissolution of the Incarnation. The Word became flesh, and in that flesh, He was crucified, died, rose again and now ascended to heaven. Christ did not shed His humanity nor His body in this returning act to God. The fact that Jesus ascended bodily into heaven may seem strange to modern sensibilities. What more, to believers of other religions? Many religions reject the physical aspect of the human existence in some way. Many view the physical as something bad that needs to be overcome. Hinduism, for example, teaches that the physical world is all an illusion. Attachment to the physical and material world would lead one to eternal rebirth or reincarnation. But if you let go or detach yourself, then you will become pure spirit and achieve perfect oneness with god in a state called “nirvana.” In both Islam and Judaism, believers are taught that God would never exist within flesh. For God to exist in a body- that would be stooping too low. 2. By ascending He could now send down upon us the promised Gift of the Holy Spirit. 3. Having ascended He now acts as our Intercessor before the Eternal Father. We pray in our liturgy that Jesus, God’s “Only Begotten Son, our High Priest, is seated ever-living at [God’s] right hand to intercede for us” (Prayer over the Offerings at the Vigil Mass) and that He is “Mediator between God and man” (Preface I). 4. Finally, He goes before us in order to prepare a place for us. As the Collect for today’s mass proclaims, His Ascension “is not to distance Himself from our lowly state but, that we, His members, might be confident of following where He, our Head and Founder, has gone before.” (Collect for the Mass During the Day, Preface 1). The Bodily ascension of Our Lord demands a rethinking of how we view our human bodies. The Lord’s body was as real as yours and mine. It was real when He was a baby lying in a manger; and when His sweaty arm reached for a tool in the carpenter’s shed; and when He collapsed into a deep sleep on a boat in a storm. His body was real when He endured the hours of torture during His passion, when He took His last breath on the cross and it was real when He rose from the dead. At first, His disciples thought He was a ghost and that Jesus had been resurrected in spiritual form, but in the sharing of meals and the touching of wounds, His disciples came to know that their Lord had risen in all His humanity – body and all. And finally, it was in this same physical body of human flesh and blood, that Jesus ascended into heaven. In the Ascension, His body was not left behind. That God would embrace human flesh into the Godhead, shatters the perception of the Divine as distant and removed from our lives here on earth. God is intricately involved with creation. The creature now incorporated into the Creator. The Word became flesh, yes, but also the flesh became Word. This also tells us a lot about ourselves as human beings. We are accepted and embraced not in spite of our humanity but within our humanity. Our bodies are not a “necessary evil” but the handiwork of the One who accepts them even in their imperfection. Let’s stop hiding and pretending, but rather, let us come to God in all of our humanity with the comfort of knowing that God, the Second person of the Trinity has holes in His hands, and is now bodily present in Heaven; the first born of all creation, pointing to the glorious, exalted future that belongs to us all. Yes, the Word became flesh. Indeed! It is astounding that on that first Christmas Jesus came to earth and took on human flesh. It is just as astounding that at His Ascension, He kept it! In doing so, the Son of God tells us that He cares, not just for our souls, but for our bodies as well. He has redeemed both. He will save both on the Last Day. Therefore, there is absolutely nothing belittling or flawed in existing as flesh and blood. The only problem with our existence is that human flesh has been riddled with sin since the Fall. But God took on flesh so that He could undo the damage sin has done to flesh. In the resurrection, He will give us a body such as the one He now enjoys. He will create a new heaven and a new earth—a new physical world. And once again, His dwelling will be among us. Until that time, we demonstrate our love for the Lord by caring for people’s souls and for their bodies too. For Christ loves both. Until that time, we have the Eucharist, the body and blood, soul and divinity of Our Lord Jesus Christ to “kindle in our hearts a longing for the heavenly homeland and cause us to press forward, following in the Saviour’s footsteps, to the place where He entered before us” (Prayer after Communion at the Vigil Mass).